Two sets sold; VCD or VCD Box Set. VCD Box Set includes a "Poster Book" with four (app. 23 ½ x 17) double-sided posters. With an impressive record-breaking start, the girls of SPEED truly lived up to their namesake. Hiroko Shimabukuro, Eriko Imai, Takako Uehara and Hitoe Arakaki had it made, but their time as a group ran out this past year. No worries, folks -- these girls went out with a bang at their finale performance, "SPEED Final Dome Tour Real Life", leaving fans with wet tissues, happy hearts, and a hope for each girl's future solo success. As for the entertainment ratings, the girls did a great job; despite the frequent urges to run across the drawn-out stage to greet fans, the girls didn't stop a moment to catch their breath over continuing their singing. Shimabukuro and Imai were indeed the stars of the show, but Arakaki and Uehara definitely had a great chunk of fan's support. For those of you who are not familiar with SPEED's songs, the girls don't all have solos a majority of the time. Heck, it's a miracle of Arakaki or Uehara get one solo LINE in a song… but it's not a wonder that the two seemingly 'backup' singers seem to be just as loved, if not more, by the fans. With a total of six costume changes, (4 different suits - 6 variations), the girls continued to give the fans a profound stage show. Their display of emotion not only brought tears to the fan's faces, but healthy glows as the cool, brisk dance moves captivated the lot. 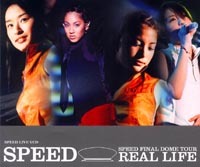 For this final tour, SPEED's backup dancers included a group totaling eleven individuals -- three of the four that now belong to Crunch, the dance-geniuses of the new group, Eriko with Crunch. For J-POP and SPEED lovers alike, this is quite an amusing show. Being that it was my first view of SPEED ever, I can say I honestly enjoyed it a great deal! ^^ If you're a bit curious on how SPEED effects the mind, this is surely a great way to go out... You won't regret it! Original Material © 1999 / 2000 ANIMEfringe, All Rights Reserved.